If you’re an operator of a Family Entertainment Center (FEC), roller skating center, bar, bowling center, or are interested in operating a standalone amusement venue at air shows, fairs, carnivals, or any other live event, a Lazer Mazers laser maze can be a perfect addition to any live entertainment experience. 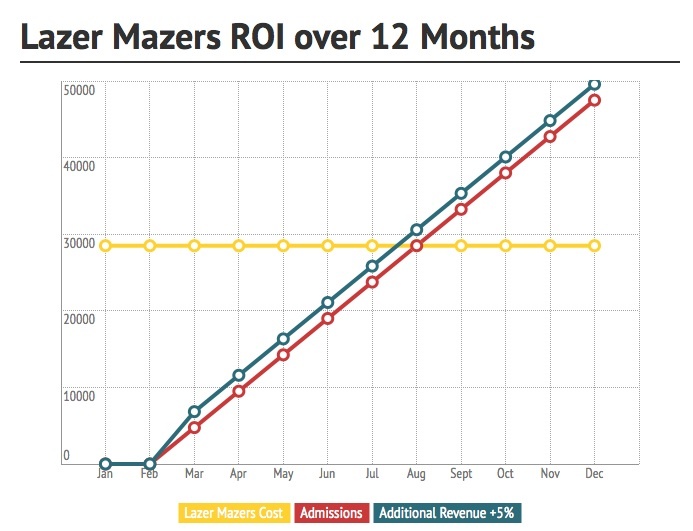 At only 75 seconds per average session, one of our three lazer maze creations or a customized version of your own lazer maze can start turning profits in just six months. In addition, a Lazer Mazers lazer maze conquest is a destination attraction in and of itself and will surely attract more business to any of your other family fun entertainment activities. Pricing (We recommend between $4 and $7 per play). The number of players that can play simultaneously. How much overall entertainment center revenue will increase due to adding an additional feature. We recommend maze configurations that allow 25-30 players per hour on average as a target throughput goal. Most locations will recover their initial investment in less than six months, some in as little as three. To download our pro forma for an accurate appraisal of ROI, click here. The graph above demonstrates a typical return on investment over 12 months. We have added a bar graph that represents a 5% increase in revenue due to the addition of a new attraction at your center based on an annual gross of $500,000.